How do adamantane drugs block M2? Vaccination plays such an important role in our seasonal influenza strategy in part because we don’t have many medicines that can be brought to bear on the disease. The neuraminidase inhibitors (specifically Tamiflu) are widely stockpiled, and continue to work for now, but the specter of resistance is already lurking. If these drugs are too widely or too improperly used, there is a good chance that resistance mutations will eventually render these drugs ineffective. Universal drug resistance may already be the fate of the drugs amantadine and rimantadine, built on an adamantane backbone (1). The adamantane drugs inhibit the M2 proton channel from influenza A, a tiny tetrameric protein that equalizes pH between the virus and the endosome of the cell that has swallowed it. This process releases the virus contents so that they can do their damage to the cell, so these medicines can significantly retard the infection process. Or rather, they could, if so many influenza strains didn’t harbor the S31N mutation that almost completely nullifies their effect. If we are to develop new drugs to attack the M2 channel, it would be helpful to know how this mutation causes drug resistance. Over the past few years a great deal of structural evidence has accumulated showing how adamantane drugs work on the older, non-resistant channels. The problem is that the evidence supports two different models of M2 inhibition, and so far it has proven difficult to determine which of them is probably correct. The controversy is the result of two structures published in Nature early in 2008 (2,3). The first of these is a crystal structure of a tetramer of peptides encompassing the transmembrane (TM) region of the M2 channel reported by the DeGrado group at UPenn, which you can see at right (explore this structure at the PDB, noting that the numbering is off by 21). In the detergent used for crystallization, the peptides form a tetramer with a roughly conical pore, which amantadine (purple in these models) physically occludes, giving rise to the pore-blocking model (PBM). This model is consistent with previous results indicating that a single amantadine molecule is sufficient to inhibit the proton channel. In addition, in this model the drug binding site is adjacent to S31 (blue side chain), which is what we’d expect given that an S31N mutation is responsible for most amantadine resistance. The authors propose, given the position of the S31 side chain, that the mutant asparagines form a hydrogen-bonded network that is too constricted for amantadine to bind. Click on the picture for a larger view. An alternative model was proposed by Schnell and Chou from Harvard University (3). They produced an NMR structure (left) of a 42 amino-acid peptide from M2 encompassing the TM region and an additional C-terminal helix (explore this structure at the PDB). 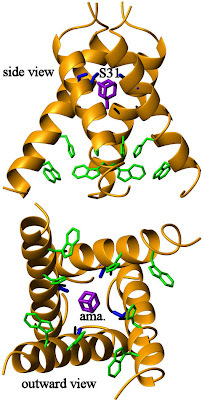 In their structure, taken at pH 7.5 in detergent micelles, the tetramer forms a roughly cylindrical pore that is blocked by the side chains of the known gating residues W41 and H37 (light green in these models). Their structure shows rimantadine bound at four sites near the base of the helix but not in the pore. Using pH-dependent conformational exchange experiments, Schnell and Chou showed that a decrease in pH caused rapid structural changes in the channel, motions that rimantadine slowed. On the basis of this evidence, they proposed a mechanism in which protonation of the gating histidines destabilizes the packing of the TM helices and allows the conductance of protons. Rimantadine blocks the channel by stabilizing the helices, thus this is a dynamic quenching model (DQM). The position of S31 in this model is also somewhat different than the crystal structure, although these models were made at different pH conditions and so this may represent a difference between the closed and open states of the channel. The distinction here is important. If Stouffer et al. are correct, then drug development should abandon the adamantane backbone altogether and start with a set of significantly different leads to address the resistance problem. The PBM implies that any molecule large enough to occlude the pore will be too large to fit in there following the S31N mutation that induces amantadine resistance. If the DQM is correct, however, then it is conceivable that further refinements to the adamantane base, or similar molecules, could improve affinity enough to overwhelm the mutational effect. Unfortunately, neither result is unimpeachable. Although it agrees with a great deal of experimental evidence, the low resolution of the crystal structure means that the electron density called amantadine cannot be assigned unambiguously. It is also curious that a hydrophobic molecule like amantadine would bind tightly in the hydrophilic pore. In addition, the crystal form with amantadine bound contains a mutation, G34A (black side chain), which is near the drug binding site and could conceivably have altered the binding specificity of the protein. The NMR structure has the advantage that it directly includes distance information in the form of NOEs. However, the authors used 40 mM rimantadine to obtain these results, meaning that there were as many rimantadine molecules in the solution as phosphate buffer molecules. Under these conditions, it is possible that the drug bound to a secondary, low-affinity site. Even if this is what happened, it is strange that the rimantadine never bound to the high-affinity site indicated by the crystal structure. Both experiments use significantly truncated constructs and highly artificial systems to mimic a membrane environment. The structure of any membrane protein depends in often unexpected ways on the composition of the lipid bilayer in which it is embedded and on the structure of that bilayer. The intense curvature of the micelles may have distorted the structure in the NMR experiment, and possibly inappropriate lipids may have had effects on both structures. We know these considerations are relevant for this system, because Schnell and Chou report that the construct used for the crystal structure would not form stable tetramers in the micelle system. Also, as Chris Miller notes in his commentary on these papers (4), there were questions about both constructs with respect to their proton conductivity. Lacking significant stretches of the protein and placed in these environments, it is possible that both structures deviate from in vivo reality in significant ways. Because the conditions diverge so much, it is difficult to weigh the mechanisms based on these structures alone. The binding site identified by Schnell and Chou is only at the very end of the construct used by Stouffer et al.. In addition, the inhibited crystal structure comes from a low-pH condition while the NMR structure exclusively represents a high-pH condition. Given these differences in conditions, it is not impossible that both models, in whole or in part, are correct. We must turn to additional experiments and alternative evidence to choose between them, specifically data on the stoichiometry of binding and the effects of mutations. The crystal structure shows a single binding site for the drug, while the NMR structure implies four, and this is at odds with existing results that indicate that a single molecule of drug is sufficient to inhibit a single channel. Given the homotetrameric nature of the M2 channel, it is in principle not possible for the NMR experiment to distinguish between a single rimantadine binding event and four. That is, the NMR experiment cannot tell us whether the rimantadine-M2 inhibition occurs with a single binding event or requires four drug molecules to bind. Therefore, to argue that DQM is inconsistent with 1:1 stoichiometry overstates the case somewhat. It may also be somewhat overstating the case to say that there is only one amantadine binding site on M2. Washing amantadine out of your buffer does not reverse inhibition, in part because of slow kinetics of leaving the binding site and in part because these drugs, being very greasy, preferentially partition into the lipid membranes and are therefore not readily removed from a system when its aqueous phase is replaced. It is difficult to measure a binding constant for the drugs because the equilibria under consideration will be quite complex. The studies often cited on the 1:1 stoichiometry (5,6) use structural and kinetic evidence to get at this question. Czabotar et al. (5) measured tryptophan fluorescence in M2 as a function of pH and rimantadine concentration. They found that fluorescence from W41 was quenched by decreased pH, but recovered when 1 equivalent rimantadine per tetramer was added. This result implies that structural or dynamic changes caused by histidine protonation are reversed by rimantadine inhibition, but this is so general that it cannot be taken to support either the PBM or DQM. Wang et al. (6) measured the reduction of surface currents in X. laevis oocytes after addition of various concentrations of amantadine. From these results they are able to construct a Hill plot with a coefficient of 1, showing that binding of amantadine is not cooperative. In further results, Wang et al. find that amantadine inhibits M2 channels slightly better at high pH (when the pore is closed) than at low pH, and that amantadine inhibits proton conductance in either direction (rather than favoring one). Both these outcomes are unexpected for PBM, but can be easily explained by DQM. However, the differences in the binding constants are relatively minor and the linearity of the current-voltage relationship may result from some other idiosyncratic feature of the M2 channel, so these results are not unequivocal. Neither experiment refutes DQM because they do not measure the number of binding sites, but rather the number of efficacious binding sites. If there are four binding sites, but 95% or more of the inhibitory or structural effect is caused by the first drug molecule bound, then these experiments would be unable to distinguish DQM from PBM. Overall, the evidence on the question of binding stoichiometry does not eliminate the possibility of four binding sites existing, but it does place a requirement on DQM that the inhibitory effect of amantadine on the tetramer result from a single binding event. Because the proposed DQM binding site for rimantidine lies between monomers and is linked to the gating tryptophan, this is not unbelievable. Other evidence from these experiments is equivocal, but can be seen as somewhat more problematic for PBM than DQM. A serious problem for DQM is that the mutations known to give M2 resistance to adamantane drugs are all located near the PBM binding site. In particular, S31 is adjacent to the drug in the crystal structure and quite distant in the NMR structure. As Miller notes in his commentary, mutational studies are substantially more difficult to interpret than is typically suggested, so this isn’t absolutely probative. In general, however, one predicts mutations to have short-range rather than long-range effects, so at least some resistance mutations ought to evolve at the binding site. However, many of the residues surrounding the DQM site are almost absolutely conserved, presumably because they are essential to the function of the channel. As a result, it would be very difficult to interpret any studies on point mutants in this area. What would be ideal, however, would be to find a set of mutations that produced a functional protein and abrogated amantadine inhibition. This is the basis for an interesting experiment conducted by the lab of Robert Lamb and reported last year in PNAS (7). In this case, the authors took advantage of the fact that the M2 protein from influenza B virus is not sensitive to adamantane drugs. They constructed a chimeric protein containing about a dozen residues from influenza A M2 — specifically, the dozen or so residues surrounding the PBM site. If PBM is correct, then we would expect that these residues, which define that site, would impart amantadine susceptibility to the influenza B channel. This is what happens, sort of. For your benefit, I have shamelessly stolen their figure (right), but you can check out this paper yourself because it is open access. In this assay, again involving X. laevis oocytes, the hybrid channel is sensitive to amantadine (bottom trace), but only half as sensitive as the wild-type influenza A channel (second from top). This result suggests that there is important context conferring susceptibility outside the PBM site. However, this could be something as simple as helix orientation, so the result does not necessarily imply that there is an external binding site. Additionally, the authors made point mutations at residues (L38, D44, and R45) that were presumed to be important in the DQM mechanism or have long-range effects on amantadine binding. None of these mutations appeared to affect amantadine resistance. In contrast, experiments in liposomes reported by the Chou group this May showed that a D44A mutation prevented rimantidine from having an effect (8). This conflict in results is difficult to reconcile, but may result from the different constructs used (the Chou group used a truncated form of M2 while the Lamb group used the full-length protein) or from changes in ion specificity caused by the D44A mutation. It might be of value to repeat these experiments with the alternative construct: truncated in oocytes, full-length in liposomes. Because the D44A mutant does not appear to conduct protons as efficiently as WT, the proposition that the function of this mutant is too deranged to provide trustworthy information should also be considered. Additional experiments in the Chou paper are meant to address the relationship between the DQM site and the mutations at the PBM site. They show that the S31N mutation prevents rimantidine binding to the remote site, and also that this mutation makes the protein generally more dynamic. From this evidence they propose that this mutation, at least, disrupts amantadine binding by destabilizing the helical packing of the channel and thus interfering with the organization of the lipid-facing pocket. They also examine an S31A mutation and find that it is not rimantadine-resistant or destabilizing to the packing. This supports their dynamic model in a limited way, because it demonstrates that only certain mutations at the S31 site will generate resistance. It does not cast any doubt on PBM, however, because in that model resistance in the S31N mutant is explained by the idea that its side chain will partially obstruct the pore so that rimantadine will not fit. I do not think it was ever proposed that specific contacts between S31 and the drug stabilize the binding; in fact, the general absence of such contacts strikes me as a concern about PBM. Chou et al. also examine the effect of rimantadine on the shorter construct used for the crystal studies. They find that the inhibition of this construct is substantially weaker. However, it also conducts protons at a much slower rate in this assay, suggesting that there may be additional serious problems with the function of this construct. It may be that it simply is not appropriate to use this construct for studies in solution or living membranes. That doesn’t necessarily imply that this peptide will give incorrect information in the stabilizing environment of a crystal. What do we know, and what do we need? Very little of this evidence unequivocally prefers one model to the other. We know that a single adamantane molecule is sufficient to inhibit M2, and while this is most obviously compatible with PBM it need not be inconsistent with DQM. 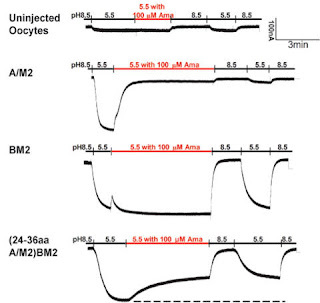 It is also apparent that various constructs of the M2 channel retain adamantane susceptibility after ablation of the DQM site, either by truncation, mutation, or the construction of a chimeric protein. In all assays, however, the adamantane drugs lose a considerable amount of inhibitory power, so these results are not entirely consistent with PBM either. And, at least in the Chou lab’s assays, interference with the DQM site also reduces adamantane susceptibility and deranges function. Moreover, the NMR data from the Chou lab shows that mutations at PBM site have a long range effect on the DQM site, which mitigates the probative power of the S31N mutation. How do we address this question? One important step would be to start comparing like to like. We are considering evidence from a plethora of constructs and conditions, and the evidence in conflict is often collected in very divergent experiments. Ideally we would like to have structures of the wild-type channel at low and high pH in a lipid environment that closely mimics the composition and curvature of a mature influenza virion. As this is unlikely in the near term, we must hope for NMR and crystal structures that at least use the same construct, minimally mutated, under similar conditions. NMR studies at low pH would be of value in assessing whether these studies in fact contradict one another. Additionally, it would be useful to make adamantane derivatives labeled with a free radical or other paramagnetic label; this would presumably allow the identification of a binding site at lower drug concentrations in an NMR experiment. Labeling the drug with a metal might also allow its identification in a crystal structure without any need to push the resolution significantly higher. Finally, actual structures of the S31N mutant, positively identifying the disposition of this side chain, would be of great value in judging the question. Structural experiments can take a great deal of time and careful tuning, a requirement exacerbated by the often-fickle behavior of membrane proteins. As such, additional mutational studies could prove useful. Inverting the chimera experiment of Jing et al. to create a chimeric protein with the upper channel from influenza B and the lower channel from influenza A may be a helpful supplement to the existing experiments. If the C-terminal portion of the channel makes a contribution to adamantane inhibition this chimera will also be rimantidine-sensitive. In addition, new mutations at S31 could help distinguish the possibilities. The PBM supposes that the N31 side chains stick into the pore and form hydrogen bonds, while the DQM supposes that they stick into the interface of the TM helices and destabilize them. An S31L mutant should disrupt the helical packing but not form hydrogen bonds or extend the L31 side chains into the pore. If functional, such a mutant ought to be rimantidine resistant if the DQM is correct, but not if PBM is correct. Assuming the geometry of the longer side chain is wrong for formation of a hydrogen bonding network, an S31Q mutation might be useful as well. Similarly, mutations that increase the size of the L40, I42, or L43 side chains could prevent adamantane binding to the DQM site without degrading the channel’s transport capabilities; the drug sensitivity of such a mutant would be a powerful argument either way. Any experiments of this kind would likely be easier to perform than to interpret, but could provide valuable insight. Obviously, it would also be important to establish that each mutant was competent at transporting protons. The unspoken assumption of the debate so far is that these mechanisms are mutually exclusive, but there is no particular reason to believe this must be so. The structural experiments definitively show that binding to both sites is at least possible — even if one clings tenaciously to the idea that the density observed in the crystal is not in fact amantadine, that structure at least shows that the PBM site is capable of accommodating the drug. It might therefore be plausible that adamantane drugs inhibit M2 using both mechanisms simultaneously, or that DQM predominates at high pH and PBM at low pH. Redundancy in inhibitory mechanisms may explain the curious features of amantadine inhibition noted by Wang et al., and the inability of experiments specific to a single site to completely account for adamantane inhibition. In addition, the fact that S31N interferes with both mechanisms may explain why it is the primary resistance mutation. An experiment with the alternate chimera mentioned above could test this possibility. In addition, if the mechanisms switch off in a pH-dependent fashion, then this should be testable with the hybrids: specifically, the A/B M2 used by Jing et al. should have lower susceptibility to adamantane drugs at high pH than at low pH. Similarly, the B/A M2 chimeric protein, if inhibited by amantadine, would be more resistant at low pH. Doubtless these suggestions are nothing new to the members of the labs working on this perhaps unexpectedly hairy question. Membrane protein structure and function is one of the most difficult experimental subjects in biochemistry, and constitutes a critically important frontier in scientific efforts to improve human health. It is infinitely easier to propose most of these experiments than it is to perform them, and I would be remiss if I did not temper the persistently critical tone of this post with some praise for the efforts of all the scientists involved in this research, and for their commitment to getting the right answer. These papers represent years of work by incredibly talented people using some of mankind’s most advanced scientific techniques. The lack of clarity on the question of adamantane drugs binding to M2, even in the face of this amazing effort, is a testament to the enormous difficulty of researching these critical systems. The Scientific Activist and Discovering Biology in a Digital World also have interesting posts on this subject. Just as an addendum, Pielak et al. 's structure of the S31N mutant has now been deposited in the PDB under the accession code 2KIH. I believe the inter- and intra- monomer NOEs were assigned, as previously, by minimizing structures against intra-monomer NOEs and then assigning incompatible restraints to inter-monomer contacts. Given the controversy, it might be worthwhile to repeat the experiment with an even mixture of 13C/15N labeled and unlabeled protein, and perform X-filtered NOESY experiments to unambiguously identify inter-monomer peaks. For those who want to delve deeper, Mei Hong and her group have put together a really excellent review that will soon appear in Biochemistry. The adamantane drug question is addressed, as are some more basic aspects of M2 structure and function. If you have serious interest in this topic, I highly recommend you check it out. The DOI is 10.1021/bi9008837. Is there any reference that M2 equalizing pH on both sides? cAMP gives CAP a twist Let’s explore the spectral density!